Just last month, I learned about the Gershwin brothers, and lyricist Ira in particular, in Park Square Theatre's excellent play with music Words By... Ira Gershwin and the Great American Songbook. 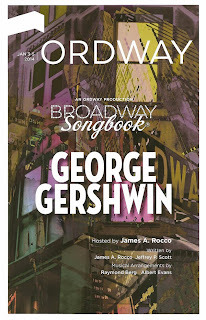 My education was furthered this weekend with the latest in the Ordway's always entertaining Broadway Songbook series, featuring the music of composer George Gerswhin. Ordway Artistic Director James Rocco tells the story of George's life and career, interspersed with relevant songs performed by some of the top musical theater talent in the Twin Cities. And it's a great story at that - an American success story with a tragic ending. Sons of Russian Jewish immigrants, the Gershwin brothers grew up in Brooklyn, where George was a prodigy on the piano. He soon found fame as a composer for Broadway and movies, collaborating with Ira and other lyricists. George died at the age of 38 from a brain tumor, but forever changed American music in his short but prolific career. This Broadway Songbook features a significantly larger cast than past Songbooks. Ten singer/actors, each one of them a true talent, are accompanied by Raymond Berg on piano and Eric Solberg on upright bass (for an extra touch of class and jazz). With the likes of Christina Baldwin, Dieter Bierbrauer, Gary Briggle, Isabella Dawis, Jennifer Eckes, Joel Liestman, Ann Michels, Bryan Porter, Kersten Rodau, and Therese Walth, the cast does not simply sing the songs, they perform them and truly embody the humor and emotion in each composition. The benefit of having this large cast is the gorgeous full sound that they're able to achieve in the group numbers, but the bad news is that with such a large cast, each of them only has one or two solos, which in many cases left me wanting more. Such is the danger of having so much talent on one stage and only two hours to display it! James has chosen a selection of Gerswhin songs from the familiar ("I Got Rhythm") to the obscure ("When You Want 'Em"), but all serve a purpose in the narrative. Surprisingly, there are no selections from the opera Porgy and Bess, but James did take the opportunity to plug the tour of the 2012 Broadway version coming to the Ordway in March (I second that - I saw it on Broadway and it's absolutely stunning). The evening includes too many wonderful moments to mention, but a few of them are: Christina and her boys (Joel, Bryan, and Dieter) singing the playfully seductive "Do It Again," the gorgeous ballads "How Long Has This Been Going On" (Kersten) and "Embraceable You" (Ann), some seriously great scatting by Jennifer in "Stiff Upper Lip," Christina's mic going out towards the end of "By Strauss" with her unamplified voice filling the theater (which makes me wish they'd do a song or two unplugged), the beautiful harmonies on "Love Walked In" (arranged by Raymond), and the comically drunk "Vodka" by Kersten. The highlights of the show are the two group numbers. The casts presents a medley from the 1931 Pulitzer Prize winning musical Of Thee I Sing. Not only do we get to hear some of the witty songs in this political satire, but we get a glimpse of what the whole show would be like. The show closes with a unique original vocal version of Gershwin's masterpiece Rhapsody in Blue. The story of George's life and career in words (written by Albert Evans and arranged by Raymond) set to this iconic and instantly recognizable music is truly stunning. This is another great installment in the Broadway Songbook series, which has taught me so much about the history of musical theater - my favorite thing in the world. I've attended all but one of the shows presented in the past three seasons and it's building up to be quite a nice curriculum. And if you're a musical theater fan, it really is required curriculum. Great stories and information accompanied by iconic music wonderfully performed by local favorites. Only one performance remains tonight, if you're brave enough to dare going out in the subzero Minnesota winter. Otherwise, make your plans for the final Broadway Songbook of the season, featuring the composing team Comden and Green, in June. I can't wait to see what next season will bring to further my education!